Native to the Fiji Islands. Related ferns include Staghorn, Maidenhair, Sword, Brake and Holly. Fronds are finely divided, up to 12 inches long, 6 inches wide. Fronds are attached to rhizomes covered in papery bracts giving a “furry” appearance. Rhizomes grow slowly along the soil surface. Chill sensitive, store above 55F. The cultivar ‘Plumosa’ is feathery and more gracefully drooping. Most are classified as “epiphytes” or air plants as they grow on other plants and elevated supports. They are not parasites but obtain water and nutrients through a spongy covering of their roots. The genus was named for the Swiss botanist, Edmund Davall, 1763-1789. Members of this family do not produce flowers as they reproduce by spores. Spores are contained in sori or “fruit dots” and appear as dark spots on the lower surface of mature leaves called fronds. 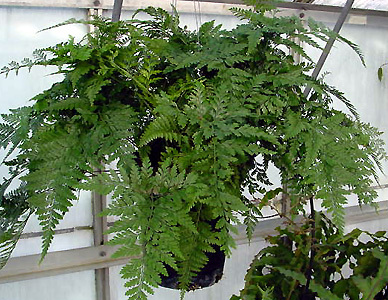 As with all true ferns, runners can be formed that can be left to grow or cut off. If they come in contact with moist soil, they can root and develop into another plant. Will generally grow well in light levels bright enough to read a newspaper in comfort.